The stock repositories on Cydia are literally packed to the rafters with a myriad of tweaks and extensions that literally exist to change almost every part of the iOS platform on jailbroken devices. No matter what you want to do with iOS, such as theming it or changing how a certain part functions, there is always a way. A new jailbreak tweak called Aerial allows iPhone and iPad users to apply a bit of color and customization to the status icons on the status bar. The concept of Aerial is actually very simple. 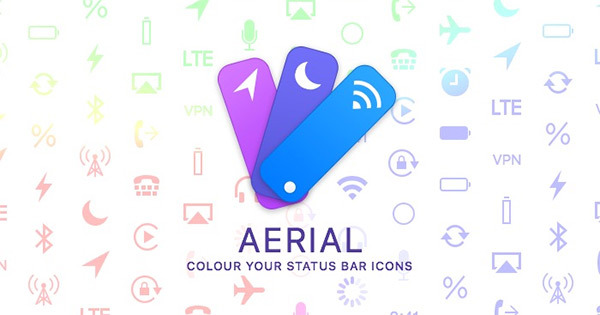 Rather than being a complex installation or tweak that tries to do too many things, Aerial is a small package which rips through the status bar icons that represents various states and things throughout iOS, and allows a user to apply a colorful fill and stroke to them in order to inject a bit of character to the device’s interface. In all honesty, simple is all it needs to be as it definitely works, is very easy to use with no learning curve, and isn’t going to crucify the device battery. After installation, it’s as simple as choosing the icon that you wish to change, and then applying a stroke color to it which wraps the icon itself in the chosen color. 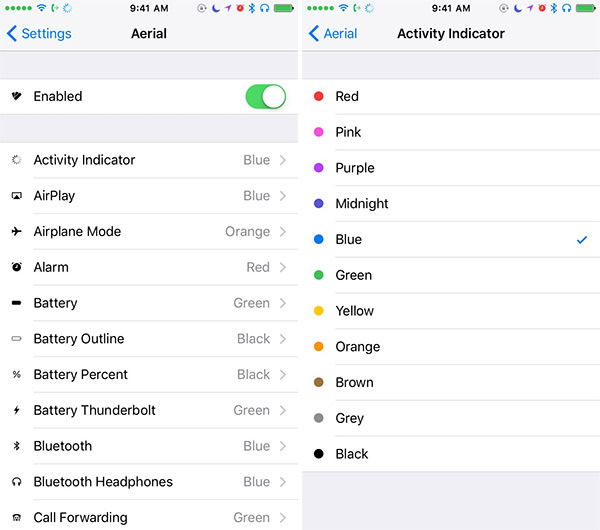 Anyone installing Aerial should also know that the colored status bar icons will only display colors when in-app, and not on the iOS Lock or Home screen. Different icons on the status bar can have different colors and combinations applied to them which basically means that potentially you can set up a very rainbow-themed status bar on the go, that is if you find that aesthetically pleasing of course. Aerial is a commercial package, available for download via the BigBoss repository on Cydia, and will set you back $1.99. Most people are used to being able to grab tweaks and extensions for free these days, but if this is the type of functionality that you actually want and crave, then it’s definitely worth parting with that small amount of money for lifetime ownership. this is the best thing and makes me, want to JB all my devices!